Robert Griffin III isn't happy with the way things are going in Washington, and his father reportedly shares that sentiment. 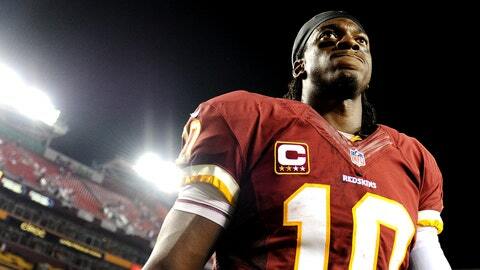 Robert Griffin III has been shut down for the season, and he isn’t too happy about it. Neither, reportedly, is his dad. The Washington Redskins quarterback’s father, Robert Griffin II, was heavily involved in his son’s development as a quarterback in his younger years and was very visible during the QB’s career at Baylor. Now, he’s making his presence felt within the Redskins’ organization, according to Jason Cole’s recent piece for Bleacher Report. The elder Griffin, who was spotted in the Redskins’ locker room after a recent game, has become a nuisance for Washington, privately questioning Mike Shanahan’s decisions in last year’s playoffs that led to the younger Griffin’s knee injury, according to The Washington Post. He even called for new leadership for the team and has been reportedly lobbying for Baylor head coach Art Briles, who coached RG3 for four years in college, to be the ‘Skins’ next head coach. Cole’s report also reports that RG3 wasn’t exactly the easiest player to coach this season, claiming he was often frustrated with the offense and even dismissed corrective criticism from coaches on the sidelines. Griffin also apparently has refused to alter his footwork to improve his passing, with one team source reportedly acknowledging the quarterback can be arrogant. Griffin and Shanahan have apparently stopped talking since the quarterback’s benching, according to a report that surfaced Sunday. That doesn’t bode well for Shanahan’s future with the team, which after a 3-11 start to this season doesn’t look too bright anyhow. With Shanahan potentially on the way out, the elder Griffin may be able to get a hold of team owner Dan Snyder’s ear and convince him that Briles is the best man for the future of the franchise. Google's most-searched athlete in 2013?